WINNIPEG, MB - Welcome to New York, Giancarlo Stanton. Coming off of a major league-leading 59 homeruns last season, the recently traded 28-year-old monster of an outfielder helped the New York Yankees crush the Toronto Blue Jays 6-1 on Opening Day 2018 from Rogers Centre. Watch game highlights, click here. Picking up exactly where he left off in 2017, Stanton was a force to reckon with at the plate on Thursday. Beginning the game with a two-run deep to right field off of Jays’ starter J.A. Happ in the top of the first, the 6-foot-6, 250-pound slugger picked up two RBIs in his first plate appearance as a New York Yankee. After being dealt to the Yankees by the Miami Marlins this past off-season, Stanton proved his worth with two homeruns and a double in New York’s Opening Day Victory. 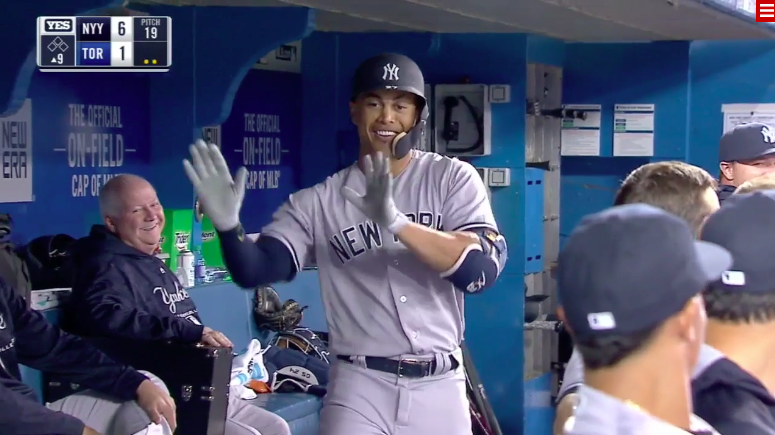 Stanton’s second homer of the season came in the top of the ninth, as he absolutely crushed a Tyler Clippard offering to deep centerfield. Stanton collected four RBIs on the day. It was an Opening Day to forget for Toronto, as the offence came up dry. Failing to reach base for what seemed like an eternity, newcomer Curtis Granderson recorded Toronto’s first hit with a single in the bottom of the fourth inning. New York starter Luis Severino came up huge for the Yanks, fanning seven Jays, while only allowing one hit in five and two-thirds innings of work. Toronto’s Happ only lasted four and two-thirds, allowing three runs – two of which were earned – but managed five strikeouts in the loss. Blue Jays’ centerfielder Kevin Pillar finally gave the sold out crowd at Rogers Centre something to cheer about in the bottom of the eighth inning, as the shifty outfielder went yard for his first homerun of the season off of big 6-foot-8, 270-pound Dellin Betances. However, Pillar’s strike was far too little, too late for the lifeless Blue Jays. An issue of deeper concern was that of former American League MVP Josh Donaldson’s inability to make consistent cross-diamond throws. The third-baseman struggled severely with his power and accuracy while attempting to beat out runners at first. Luckily for Toronto, it is only game one of 162. Although hoping to avoid beginning the season with a similar record to last year’s 2-11 start, a deep playoff run is not expected of the club for the 2018 season. Earlier on Thursday, the Blue Jays announced that shortstop Troy Tulowitzki had been placed on the 60-day disabled list, as he continues to struggle with bone spurs in his heel. The 33-year-old will not be eligible to return until the end of May, or early June. Aledmys Diaz started at shortstop for the Jays Thursday. Before opening pitch, Dan Shulman and the Toronto Blue Jays honoured the late Roy ‘Doc’ Halladay with a touching video tribute, jersey retirement and an on-field presentation with his two sons delivering the game ball to the pitcher’s mound. Halladay passed away in a plane crash on November 7th, 2017. He was 40 years old. Aaron Sanchez and the Jays will resume the series against Masahiro Tanaka and the Yanks Friday evening. Opening pitch is schedule for 6:07 P.M. central time.